Quality Control | Takumiya Corp.
At Takumiya, we pride ourselves in offering the world's finest quality products. We provide food safety and security for all. and to be known for our world-class product quality! The intent behind our goal of being the world's happiest company is shown in the figure to the right. 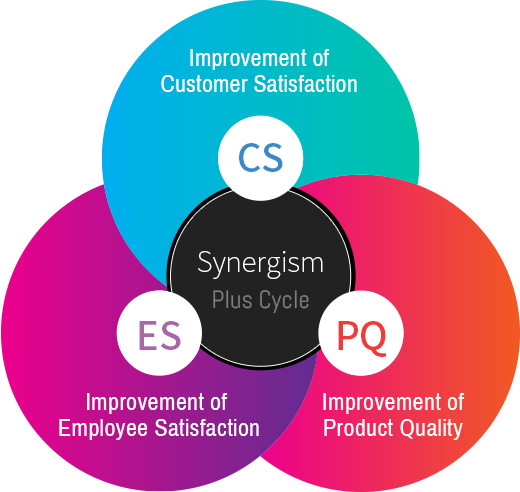 We believe it illustrates the inseparable connection between Customer Satisfaction (CS), Employee Satisfaction (ES), and product quality. Our goal as a company is to be the sort of place where employees are lively and happy as they work, thus enhancing product quality and customer satisfaction in turn. 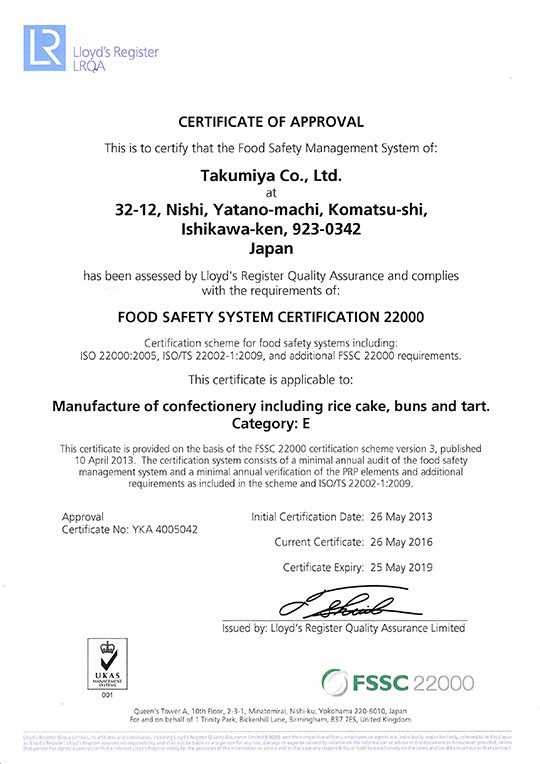 based on FSSC 22000 standards. We conduct a hazard analysis for all raw materials and processes, and facilitate CCP (critical control points) on all lines through the implementation of heat sterilization and foreign matter removal processes. Additionally, all processes are monitored and logged. We have adopted a system that can smoothly track down causes of unexpected issues, and create accurate records as necessary. We are fully equipped to facilitate sanitation management of our workers and facilities, as well as to deliver safe and secure products to our customers. We inspect piping, parts, and equipment for leaks and test for airtight seals. We use metal detectors to test for oxygen scavengers (iron-based). High precision detection and prevention of metal contaminants. Detects metal, bone, shell, rock, glass, rubber, and plastic contaminants.